Marina Berdnikova lives in a village near Novgorod The Great, where her husband works as the senior designer at a famous porcelain factory. The nice home of these artists is full of different art objects made by their hands. Marina started to make teddy-bears three years ago, and very soon she became one of the most requested toy-makers in Russia. 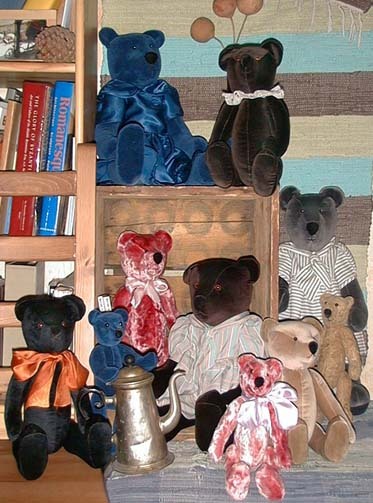 The principial difference of her bears is she makes them using vintage fabrics, laces and ribbons. Marina's bears look very Russian styled, they remind those bears which were traditional heroes of Russian fairytales. Marina's bears were displayed at many toy exhibitions, she is a permanent participiant of Vakhtanoff Doll gallery exposition (the leading Doll Bear Gallery in Moscow). We are opened to participation at any toy shows and exhibitions. We'll be also glad to collaborate with stores and retailers, special prices are possible if you buy three or more items. All toys presented here are hand made personally by artists (no copies). All prices are including shipment. If you'd like to see any toy better, please e-mail, we shall send you more detailed pictures.